Politico reports Tom Price spent more than $400,000 in taxpayer money on private jet flights since May. President Donald Trump says he's "not happy" about Health and Human Services Secretary Tom Price reportedly using taxpayer funds for private flights. And it may cost Price his job. When a reporter asked Trump on Wednesday if he would fire Price for his actions, the president responded: "We'll see." Politico reported Price took at least 26 private flights since May, even when multiple inexpensive commercial options were available. That reportedly cost taxpayers more than $400,000. 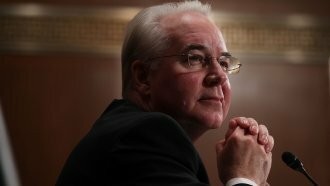 The HHS inspector general is currently reviewing Price's travel, and the White House hasn't defended the expensive flights. Trump said he'd be willing to fire Price in July if he couldn't help repeal and replace Obamacare. He said to Price and the crowd at the National Boyscout Jamboree: "Are you going to get the votes? He better get them. ... Otherwise I'll say, 'Tom, you're fired.'"